A couple of weeks ago the First Reader decided to celebrate our second grandchild by hiring some men with machines to do something about our back yard. When we moved into this house that yard was a smooth expanse of grass with a paved walk out to a tiny stone-build back patio; a wonderful place for children to run, shout, play, build forts, splash in wading pools, and so forth. Being able to turn the kids out to graze probably saved my sanity in those early years. 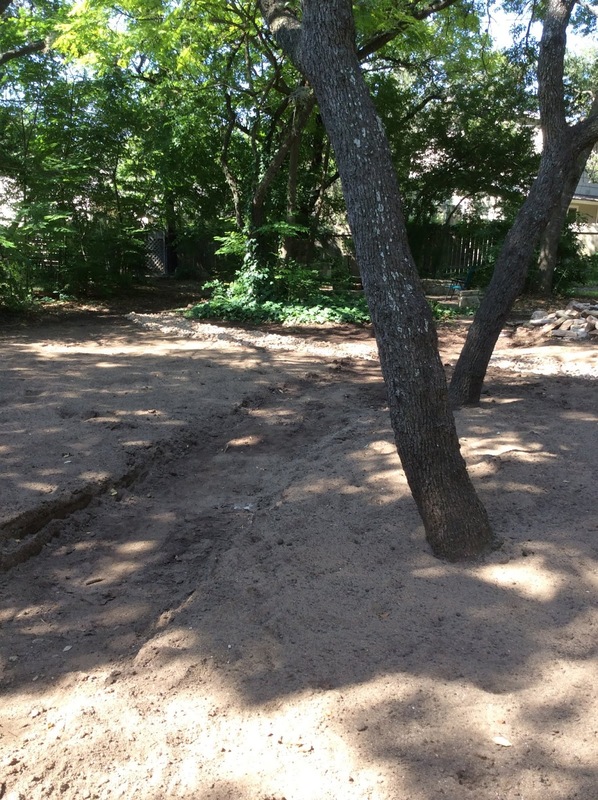 Time passed, the children grew up, my early gardening ambitions expired after the discovery that what we actually had out back was a thin layer of topsoil over a solid chunk of the Balcones Escarpment and the First Reader's interest in maintaining a lawn diminished under Austin's watering restrictions. 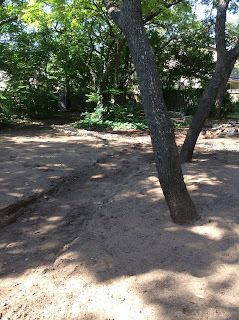 What remained was a kind of wasteland in which live oak seedlings had conquered the grass and the paved walk had been turned into an obstacle course of broken concrete slabs by the roots of those nice volunteer live oaks that shaded the porch. So... a couple of days ago the men and their machines showed up and spent an active day making a wide variety of noises. Chainsaws, wood chippers, and a thing like a baby bulldozer prowled the land. The dog moved into his favorite closet, the one he uses when thunderstorms roll through town. I moved into the library, streamed some Mzee Yusuf hits for atmosphere, and moved (mentally) into Mombasa's Old Town with Thalia and Lensky. The dogs' reaction was purely ecstatic. They spent the better part of an hour racing around the bare dirt, going up and over the mounds and diving into the trench that is, I'm told, a future drainage ditch. "This is the best playscape ever, Mommy! Don't ever change it!" I wonder what they'll think when the ground cover is planted? With any luck, the won't just dig it all up. ;-) This is my kind of gardening and landscaping - let the pros and their big equipment have at it! Would have loved to see pictures! Best Fence Contractor is a true artist with wood. He and his crew designed and built an architectural fence for the front of our house. We then had him design a wood treatment for the posts and overhang for our front porch. It is beautiful in design and execution. I would highly recommend him visit this site.